Build Your Own Zip Line! 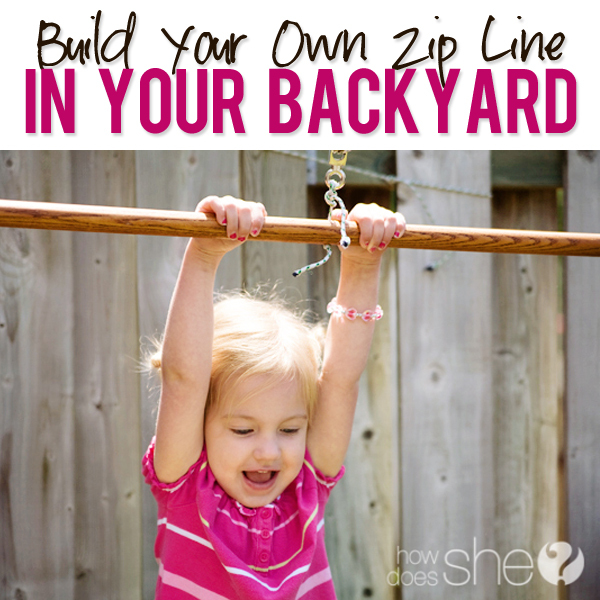 Build Your Own Zip Line in your Backyard! My husband is pretty adventurous when it comes to making things. He’ll just get an idea in his head, this plan of something he wants to create, and he’ll see if he can find a way to do it. This week he decided he wanted to make a Zip Line in our backyard for our kids! And he did it for less than $10. First you’ll need something for a handle. We had this dowel sitting around so we used it. You could buy something similar for probably around $1-2. Drill a hole in the middle of it. Next, a pulley. This one cost about $3. And a rope. We tried this with a nylon rope which we found to be a bit too stretchy (our zip line was gradually becoming lower to the ground each time it was used and we had to keep tightening it). So, try to find a rope that is not too stretchy and is meant to handle the weight of your child!! You could also use cable management products to help secure the pulley. Then use a longer piece of rope to run through the pulley, and attach to something up high, on either side of your zip line. We used a fence. You could use a tree or whatever else is available in your yard. We were making ours for little kids, so we didn’t make it very high off of the ground (the little one was never more than inches from the ground and the older one had to lift her legs up). It was definitely a hit and thrilling enough for our little girls, though (and Daddy was always close by to hold the 3 year old and help her). Oh, the fun that was had! It really didn’t take very long to make and it was so fun & easy! Have you ever built something really fun for your yard? Tell me about it in the comments, I’d love to hear your ideas! P.S. 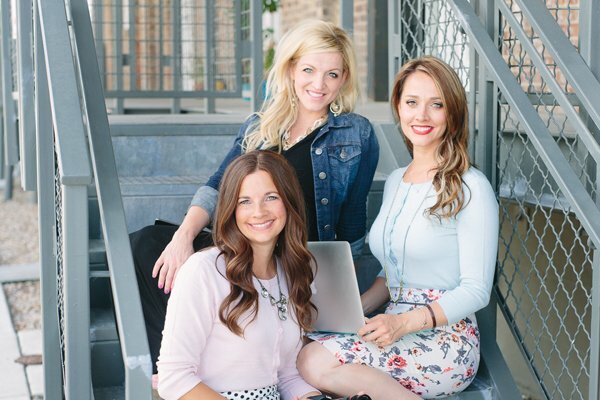 Come see what else we’re up to at Raising Memories Blog! « A New Twist on Crepe Paper Streamers! I can’t believe he came up with that! I love the last picture of K’s face! So cute and so fun! So simple, yet so much fun! The best kind of projects. What a fun idea! Tell your husband thanks for sharing! My brother built a zip line in his backyard a few years ago. The kids loved it… the adults loved it! Lots of fun. 🙂 Do be careful though, my little sister lost her thumbnail when she accidentally per her hand in the wrong spot and the little roller thingy (technical term) ran over her thumb! OUCH. She survived and it didn’t stop us from using it. HAHA. Oh dear!! Good to know to watch for that!! yikes! I still cannot get the summer reading star free printable. The link is not working. I read several other comments of people who were having trouble too. Please help 🙂 I would love, love, love to print these off. Thanks again for all the free printables. I’ve passed this on- hopefully you’ve received an email that helps? Let us know if you’re still having problems! Fun way to keep kids occupied! Do you still have the iShare website? For the last several days I have received a “forbidden” message when I try to access it. Yes, it’s still there. We had some server issues…still have some server issues. ishareprintables is good, but the crafts is struggling. It should be good and strong by monday. Not to be grim, but these can be very dangerous. http://www.huliq.com/3257/georgia-woman-clings-life-after-zip-line accident. Of course anyone who tries this should be very careful, you are right! The story you refer to was a high zip-line (the woman fell into a river and suffered a gash to her leg). The zip line we made was so close to the ground that my 6 year old could walk while holding it if she didn’t lift her knees. We supervised very closely & held the younger one when she used it- it was pretty tame & we were very cautious! Thanks for posting this! Just saw it on pinterest. we have a sloping yard and two perfect trees. I’m very excited to try this. What a great idea. My kids would LOVE this. So easy, quick and inexpensive. I am featuring this at somedaycrafts.blogspot.com. No, no, no—a thousand times no! Zip lines can be extremely dangerous (Google Aimee Copeland to learn more about how she was horribly maimed after being injured by a homemade zipline). Leave this to the pros–both the construction and the installation. As with many things, you are right, it is very important to be careful! Aimee Copeland fell from a large zip line, into a river, and ended up with a gash in her leg which became infected by a rare flesh eating disease! This injury would be impossible on our little zip line! Of course we were still very careful with it- helping our girls to hold on, holding them as they used it. It was so close to the ground that our 6 year old could stand on the ground and hold the handles at the same time. We’re talking about a very mild zip line in this post. Love this! Question though, was your line straight across or was one end higher than the other to make your kids glide across? Thanks for another great idea! That is one of the coolest things I have seen in a while! Wish I had a high point in my yard to attach it to. May have to build something…thanks!!!! Rope is not really a good choice for this. Nylon especially is very susceptible to sun damage and after a few months outside will be brittle and break easily. If you want to make a strong zipline that will last use aircraft grade cable. It’s going to be more expensive but a lot safer & last longer. Thank you! I am building one in my boys’ bedroom, so they can get into their closet faster! Your instructions helped so much! I am surprised by the naysayers 🙂 Yes, don’t build this over a river! 100 feet in the air. Too funny;) Thanks again!!! BEWARE!! DO NOT MAKE THIS with the pole left so long, Because the rope is so tight, when the child lets go, it slams back and hits HARD! It hit my grand daughter in the head VERY HARD, and left a terrible place. I am so thankful it did not put out her eye!! The dowel needs to be cut short so it does not hit them in the head when they let go! BEWARE!! My GD was walking on the ground as she hung from it, and then let go. She wasn’t even doing anything dangerous and was hurt! Make sure hair (especially on a child with long hair) cannot fly up into the pulley and get pulled out) If hair gets tangled in the ‘mechanism’ this could happen. It’s safest to have as long a distance as possible from the child’s head to the pulley and rope or wire. This could literally rip hair out. I love the idea otherwise. A safer design might be to have a seat the child sits on a few feet below the wire or rope as I saw with a commercial zip line, the kids sat on something far below where it attached so there was no danger of long hair flying into the pulley. Best wishes!